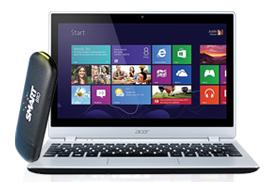 You can get a free laptop when apply to Smart postpaid Gadget plus Plan 999 plus a Smart Bro USB Plug it modem. To those who are planning to buy a brand new laptop this coming Christmas but you're on a tight budget why not try Smart. With your 999 pesos monthly charge you can get more of it aside from free Acer Aspire V5 122P Touch, you can also get free USB broadband and free internet hours.